Intel this week introduced its new RealSense Tracking Camera T265 featuring 6-degrees-of-freedom (6DoF) inside-out tracking. The tracking device is aimed primarily at various self-driving applications like small robots or drones, but can be applied to other devices that benefit from 6DoF inside-out tracking. 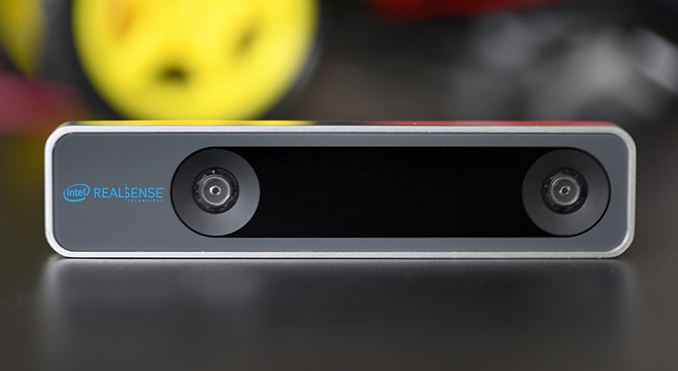 The Intel RealSense Tracking Camera T265 is equipped with two fish-eye cameras, each featuring an approximate 170-degree field of view. The data from the cameras is processed by the Intel Movidius Myriad 2 vision processing unit (VPU). Meanwhile, the tracking camera supports Intel’s visual inertial odometry simultaneous localization and mapping (V-SLAM) technology that constructs maps of unfamiliar environments and then repeatedly updates the location of a device within that environment. The hardware and the V-SLAM algorithm enable applications like robots and drones to accurately navigate within known and unknown surroundings intelligently avoiding obstacles without any need for external sensors (courtesy of 6DoF). Since all processing is done by the Movidius Myriad 2 VPU, the end device can use a very cheap SoC without a lot of compute power, but with a USB 2.0/3.0 interface. For more advanced applications that need a higher precision and depth, the RealSense Tracking Camera T265 can be paired with the RealSense Depth Camera D400-series. 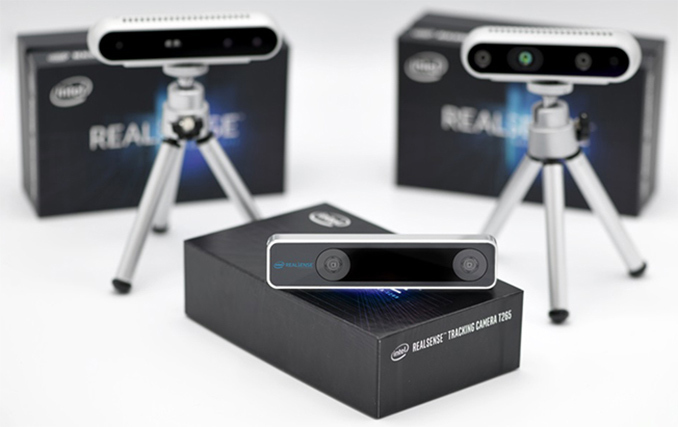 Intel will begin shipments of the RealSense Tracking Camera T265 on February 28. Each device will cost $199. Your ads are serving malware. Google chrome just said "Attackers currently on cm.mgid.com might attempt to install dangerous programs on your computer that steal or delete your information (for example, photos, passwords, messages, and credit cards)." Yeah, I made this point below. Unfortunately, as a new post, rather than a follow-up reply. To be clear, what happens is your depth accuracy should be inversely proportional to distance. The main downsides of being passive is that you need texture and illumination. The specs say it needs at least 15 lux. Now, I'm not actually sure it gives you a depth image, in which case it doesn't need texture as long as there are some features it can find in its 163 degree FoV. In fact, I'm not even sure you can get any image out of it. They don't even say whether the sensors are color. One cool feature it has is the ability to re-localize to a place it's previously seen.